As new technologies emerge, the role of government surveillance is continually redefined. Products such as E-ZPass, that allows drivers to easily get through highway tolls, also allows police to track drivers’ whereabouts. 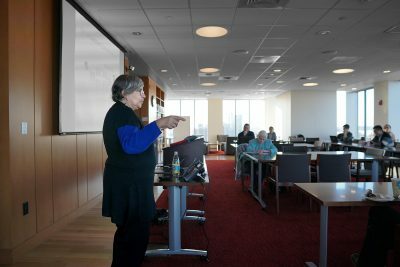 In a talk Wednesday at Boston University’s School of Law, Susan Landau, a professor of cybersecurity and policy at the Fletcher School at Tufts University, explained the legal complexities of modern communication systems. The lecture, titled “It’s Too Complicated: How the Internet Upends Katz, Smith, and Electronic Surveillance Law,” was part of the Cyber Alliance Speaker Series. The series is a collaborative effort between the School of Law’s Program on Intellectual Property and Information Law and the Hariri Institute for Computing. Stacey Dogan, a professor of law in LAW, said she was involved in developing the series and that these events allow students and scholars with backgrounds in law and technology to learn from one another and discuss cutting-edge issues. According to Dogan, the series typically hosts talks every couple of weeks and encourages participation from students across the university. Dogan said these discussions are relevant to recent current events, including Russian interference in the 2016 presidential election and the use of mathematical algorithms to determine who should receive government welfare benefits. During Wednesday’s lecture, Landau explained the findings of a 2016 paper in the Harvard Journal of Law and Technology that she contributed to with Steven Bellovin, a computer science professor at Columbia University, Matt Blaze, an adjunct professor of computer and information science at University of Pennsylvania, and Stephanie Pell, an assistant professor and cyber ethics fellow at West Point’s Army Cyber Institute. According to Landau, electronic surveillance laws were first created for telephone communications over 40 years ago. However, the creation of new electronic devices has given rise to unforeseen legal complications, she said in an interview. For example, Landau said that phones used to stay in one place, so location information could be collected by looking at the phone number. With mobile phones, a phone’s location can be roughly determined and tracked, Landau explained. In a U.S. Supreme Court decision last June, Carpenter v. United States, it was ruled that police officers need a warrant to obtain seven days of phone location data from cell phones, Landau said. “That is a decision about how privacy-invasive this information is,” she said. Landau also explained how the invention of the internet has changed the types of data that governments can access through surveillance. She said the amount of content in internet communications isn’t comparable to tracking communication in the past. “The kind of information in that metadata is very different, and the laws have not kept up with that change,” she said. Landau said that some electronic surveillance law amendments were made in response to 9/11, such as the Patriot Act in 2001, which expanded government surveillance and investigative powers in the interest of fighting terrorism. Emily Sorkin, a freshman studying political science in the College of Arts and Sciences, said she thinks the government is justified in using some electronic surveillance to protect citizens. Cybersecurity demands focus and dedication. Cybersecurity protects the data and integrity of computing assets belonging to or connecting to an organization’s network. Its purpose is to defend those assets against all threat actors throughout the entire life cycle of a cyber attack.